A local company servicing local small business. Servicing local Melbourne business websites for 15 years. Cost effective, mobile device & search-engine friendly. Feature rich affordable hosting packages. We provide everything you need to get online. 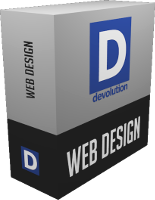 Devolution Web Design + Hosting provides everything that you need to put your business online. We will get you started with a cost-effective, search-engine friendly website and hosting package that will suit your budget. Learn more about how to turn your great idea into a great website. Get started here. Whether you are looking for a simple brochure website or a custom-made dynamic website we are able to cater to your expectations for an effective online presence. Devolution Web Hosting provides a range of tailored hosting options to suit every budget and business requirement. Starting a business? Then you'll appreciate our all-in-one starter pack. Upgrade your old site with a responsive, mobile friendly web site. Do you want easy-to-understand, useful and no-obligation advice on preparing your website design brief? Our team of web designers and developers are committed to realizing your ideas with the minimum of fuss and to your maximum satisfaction. Whether you want a simple brochure-style website or a CMS (Content Management System) website that you can maintain yourself, Devolution Web Design has the graphic artists, designers and developers to implement your website efficiently and cost-effectively whilst ensuring that your requirements are understood and met. Not only do we give you the professional web design quality that you want, we also take the time to give your audience what they want - intuitive navigation, easy retrieval of information and visual engagement. Plus we give you a search-engine friendly website that you will help you get seen. We provide everything that you need to get online - domain name registration, web design and development as well as hosting your completed website on our fast and reliable servers. If you already have a website that you are not happy with we are happy to give you a no-obligation quotation on re-designing or re-developing it. Whether you're an established business or just starting out, a website or at a very minimum, a web page is an essential tool. With your audience and goals in mind, Devolution Web Design + Hosting can get you started with a cost-effective, search-engine friendly website and hosting package that will suit your budget. Our team will give you an affordable, professional website without compromising on quality. Once your website is built and online, Devolution Web Services can provide you with a range of affordable marketing options to increase your return on investment.